Monarch Airlines says its flights are operating as normal amid fears the firm is in financial trouble. The airline says it is "trading well" after speculation that the company could go bust. Responding to rumours on Twitter, Monarch denies the firm is in trouble as worried customers continue to take to social media to ask if their flights would still be running. In a stock response, a staff member said: "We're unsure of where these rumours originated but we can confirm they are not true." A representative for Monarch Airlines says the company expected to make £40 million before tax and other cost deductions by the end of the financial year to October, despite what it said was a "difficult period" for the travel industry following terrorist atrocities, Brexit and the plunging pound. 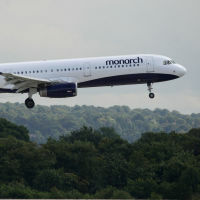 A spokesman said: "Over the weekend, there has been negative speculation about Monarch's financial health. "Our flights are operating as normal, carrying Monarch passengers as scheduled. "To weather tougher market conditions and to fund its ongoing growth, Monarch expects to announce a significant investment from its stakeholders in the coming days." Monarch, which is headquartered at Luton airport, employs around 2,800 people, according to its website. In 2014, the airline agreed a rescue deal of more than £100 million, which saw pay cuts of up to 30% for staff and hundreds of redundancies. As part of the deal, Greybull Capital acquired 90% ownership interest in the company, with the remaining 10% passing to Monarch's defined pension scheme and ultimately the Pension Protection Fund. The company, which was formed and opened its first hangar at Luton airport in 1968, says it will announce new investment imminently. Travellers planning to fly should take out travel insurance to protect against delays and cancellations.